Ethel Carrick (Fox) was born in England in 1872 and studied art privately in the 1890s and subsequently at the Slade School in London. She is known for her brilliantly coloured post-impressionist paintings of crowded streets, markets, cafés, public gardens and beach scenes. She met her husband, Australian artist Emanuel Phillips Fox, around 1901 in St Ives, Cornwall, then one of the key centres of European plein air painting. They settled in Montparnasse, Paris and travelled widely to paint, in France, Italy, Spain and North Africa, also visiting Australia in 1908 and again in 1913. E. Phillips Fox died in 1915, after ten years of marriage. Carrick Fox established an art school in Paris, exhibited at salons, and continued to travel to Australia, Europe and elsewhere. She was in Kashmir when World War II broke out and subsequently returned to Australia, rather than Paris, to escape the German Occupation. She spent the remaining war years in Sydney, Melbourne and Canberra. 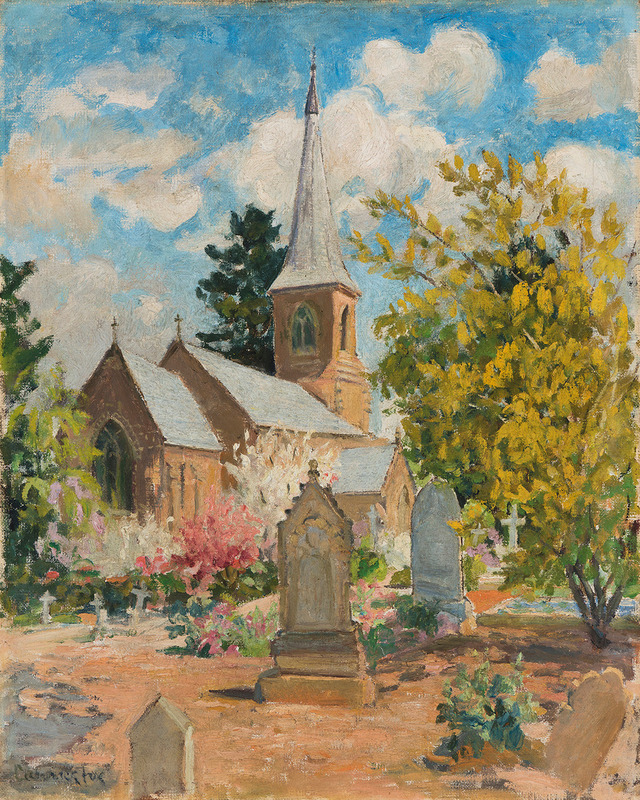 In 1944 Carrick Fox exhibited 62 paintings at the Masonic Temple in Canberra to raise funds for the war effort, specifically the Red Cross and the Services Welfare Association. The exhibition was described in the Canberra Times as ‘comprising largely spring and autumn studies of Canberra’, with ‘the greater part of the work deal[ing] with Canberra landscape’ and ‘views of St. John’s ... popular’. Other subjects included the Albert Hall, Duntroon, Canberra parks and gardens and Canberra’s Civic Centre. The National Library of Australia collection holds an expansive view from this series entitled Canberra, and the Australian War Memorial has a work from 1942 depicting women’s voluntary war work, otherwise it seems that the Canberra paintings are still largely held in private collections, possibly by descent from those who acquired them in 1944. In 2012 the Canberra Museum and Gallery (CMAG) acquired Colonnades of Canberra’s Civic Centre from this series, whichdepicts the instantly recognisable Sydney Building on a bright autumn day. CMAG’s recent acquisition, St John’s Church, Canberra,portrays the Anglican Church of St John the Baptist in Reid, which was the first church on the Limestone Plains (consecrated in 1845), and one of the oldest in the region. The Gothic Revival church and churchyard is seen here in spring, its viewpoint looking south with the chancel on the left, the west porch on the right, and the spire behind and central in the composition. Both subjects are interesting choices for Carrick Fox, as the architecture has strong resonances of her European subjects: medieval churches, and the colonnades of the Italian and Spanish Renaissance. Carrick Fox returned to Paris after the war, was back in Australia in 1948, and again in 1952, when she died in Melbourne aged 80. Andrew Sayers needs little introduction to Canberrans, nor to a wider audience for Australian art history. An illuminating figure in the Australian art world for more than 30 years, Sayers contributed extensively to the National Gallery of Australia as a curator and assistant director, was the founding director of the National Portrait Gallery, and most recently was director of the National Museum of Australia. Less known generally was his other life as an artist, although he had been painting for many years. Room with a view is a clear nod to Canberra. The familiar form of Mt Ainslie reflected in the lake is a memory of the view from the National Gallery boardroom, where the artist had spent many hours, and a clear reflection of the bush capital, which he loved particularly for the ‘clarity of its unique light.’ Sand dune, Tilba is similarly evocative of Sayers’s love of landscape and the sublime South Coast of New South Wales, where he spent much time painting en plein air and saw ‘a different light and space’. Ken Knight is a contemporary plein air painter working in a manner influenced by nineteenth century Australian Impressionism and the Australian landscape school that grew in Arthur Streeton’s wake and developed between the two world wars. 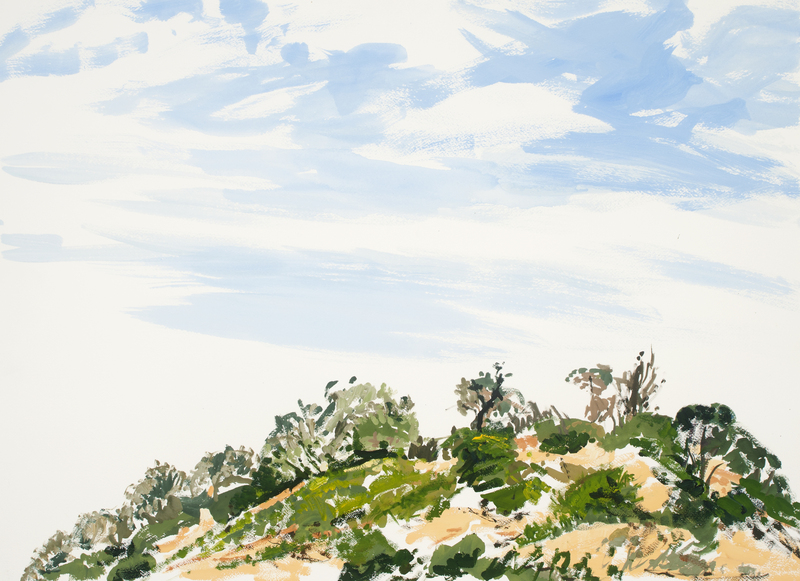 As a plein air painter Knight has travelled extensively throughout Australia – and to London, Paris, Venice, Istanbul, Egypt and India – in search of his subject, and has produced many paintings of the Canberra region, in particular in and around the Murrumbidgee River corridor. These two works are both ‘slices’ of landscape in the Streeton manner, conveying a fresh and lively atmosphere characteristic of their subjects: Lake George has a certain brooding feeling, familiar to Canberra region residents who travel the road around the hills on its south-west boundary; and Last light on the Murrumbidgee transmits the sense of distance and clarity redolent of this landscape.